You’ve finally bought that property in Thailand, but realize that you won’t be able to maintain it. You simply don’t have the time or live in another country. Don’t worry. You have a number of property management companies that can do the job for you. Below I’ve listed property management companies located in Bangkok. CBRE Group, Inc. is a global property management companya based in the US. The head office of the company is located in Los Angeles and it’s the biggest publicly traded commercial property management company in the world. CBRE has more than 70,000 employees and 400 offices in different cities, which speak for itself. CBRE (Thailand) Co., Ltd. established in 1998 when they opened their first Bangkok office, being the first international property management company to operate in Thailand. Since then, they’ve managed to expand to Phuket and currently have around 800 employees in both cities. So who’s running CBRE Thailand? Aliwassa Pathnadabutr has worked as the managing director since 2005. She’s a graduate from the Kent State University, and has worked with some of the leading Thai real estate developers in the past two decades. CBRE has won several regional and global awards, including “World’s Best Real Estate Agency” in 2015 by the International Property Awards, and the “Best Real Estate Agency in Thailand” for the past 7 years. CBRE Thailand has a dedicated property management team of 370 people that offers services related to commercial and residential property management. Property types managed include condominiums, housing estates, apartments, offices, shopping malls, and industrial properties. Sense Property Group is a Bangkok based property management company that was founded in 2013. The agency was founded by two Europeans and one Thai national, Bastien Forzy, Antoine van Innis, and Khun Joy. The company is located in the heart of Bangkok. Include property management solutions to expats, rentals, renovations, property search, and assistance in relocation. They also manage office and commercial spaces in the central parts of Bangkok. Knight Frank is a leading international property management company based in the UK. Having more than 15,000 employees, around 418 offices, and a presence in 60 countries, it’s rated as one of the biggest property management companies in the world. Knight Frank established their first Bangkok office in 1998. In 2004, they opened their second office in Phuket. Knight Frank now has around 480 employees working nationwide. Roong Sithisankunchorn is the executive director and the head of property management at Knight Frank Thailand. Knight Frank manages residential, commercial, retail, and industrial properties. Commercial properties include offices, warehouses, and shopping malls. They also offer project management services for residential and commercial projects, that include maintenance, and repairs. Company Vauban is a property management company based in Thailand, having offices in six cities. The company established in 2006 and headquartered in Bangkok. In addition to Bangkok, they have offices in Samui, Phuket, Pattaya, Hua Hin, and Chiang Mai. Cyrille Hareux is the founder and leads a team of around 40 employees. He’s a French national with an extensive experience in the financial and real estate sector. Company Vauban offers rental and property management services for residential properties only. Some projects managed include Blossom, City Beach Residence, The Star, Atlas, The Room, Espana, Whale Beach, and The Lofts Ekkamai. Siam Home Source is a Bangkok based property management company and real estate agency. In addition to listing services and home improvement services, they offer a wide range of property management services to expats and local clients within Bangkok. Include property management services for condominiums, boutique apartments, and other housing projects. Some services include tenant screening, managing leases, security deposits, rent collections, safety and property construction check, inspections, and evictions. They also offer property management services to small commercial projects. Fresh Property is a Bangkok based property management company founded in early 2015. The agency is managed and led by Pierre Leung, a real estate professional with extensive international and local experience. The company focuses its sales and marketing activities in Bangkok’s Central Business District, notably Sukhumvit (Nana- On Nut), Silom- Sathorn, Rama 9- Ratchada, and Wireless-Lumpini. Their office is located in Asoke, a vibrant business and office area in the heart of the Sukhumvit District. Fresh Property is a full-scope agency offering sales, rental, property management and consultancy services. Its property management solutions include dedicated property managers, tenancy management, maintenance, decoration and furnishing services. Below you’ll find property management companies located in Phuket. Phuket Property Management is a leading real estate agency and property management company based in Phuket. It has two offices in Phuket, the head office in Talang and a sales office in Kathu. Phuket Property Management was founded by Anthony Taylor and Naritsara Taylor almost 2 decades ago. Together they lead a team of six employees. Anthony Taylor is an expat who is now settled in Thailand. Phuket Property Management offers property management services for residential properties, offices, commercial properties, retail, industrial, land, and distressed assets. They offer rental services to both landlords and tenants. For example, they can help you to find tenants, prepare contracts, conduct property inspections, evictions, and handling paperwork and documentation. They also manage vacation houses, like villas, cabins, cottages, and beach houses. RACHASI is one of the fastest growing real estate management companies in Phuket. It was founded in 2015 and collaborate with global leading brands like Expedia, AirBnB, TripAdvisor, and Booking.com. They have a multilingual staff and European management and offer property development and property management services within Phuket and surrounding areas. Include property management services to residential and commercial clients, like rental services. The company offers two different options to clients: “All Inclusive” and “Pick & Choose”. You can read more about these packages on their website. The Pick & Choose option allows you to pick from a wide range of property management services, excluding some of the services covered under the All Inclusive deal. This can minimize the fees. Services include maintenance, deposit handling, car and motorbike rentals, cleaning services, check in/out, room service, airport transfers, marketing, monthly report, managing bills, pest control, taxi service, laundry service, and phone support. Lofty is a property & vacation rental management company that promises clients to maximize their rental earnings. They’re working in partnership with AirBnb, where they have received over 700 reviews, more than any other company in Phuket. The company offers a unique service under the “Lofty Owner” program, where the company takes care of your residential property for rental purposes. In addition, they follow a different business model compared to other property management companies in the area. Instead of charging a flat fee, they offer property management services in exchange of rental rights. They share the rental income with the property owners, including a 30% commission on short term rentals and 20% for long term rentals (more than one month). 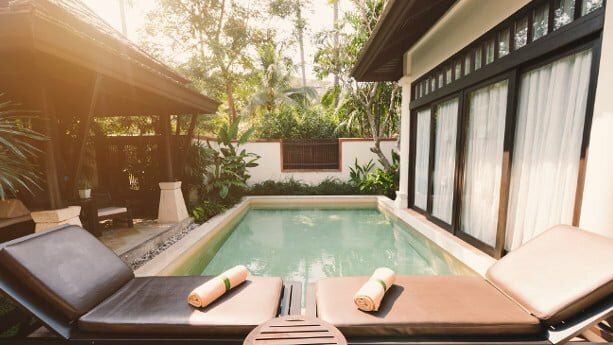 Lofty was founded by Wade Leathem, an expat who started three hotels and guest houses in Phuket, before deciding to establish his own property management company. He’s working as the CEO and heads a team consisting of both locals, European, and Chinese employees. Include rental management, light maintenance, cleaning, air conditioning maintenance, repairs, pools and gardening service, 2x cleans per month, 1x pressure washing, bill payments, and consultancy on further constructions and repairs. Azure Phuket Property Management and Villa Rentals company is a trusted name in Phuket. With more than a decade of experience working in the hospitality and real estate management industry, they’re rated among the best property management services in the region. Azure offers property management services, design and furnishing services, and rental services to residential clients. They also manage villas and other vacation houses, like cottages and cabins. Property management services include maintenance of swimming pools, garden management, cleaning services, air conditioning service, pest control, weekly inspections, billing, property insurance, and grocery shopping services. Below I’ve listed leading property management companies in Pattaya. Tebter Property is a global property management and development company based in Australia. In addition to their head office in Port Melbourne, Australia, they have a presence in China, Hong Kong, Singapore, United States, and Thailand. In Thailand, they’re based in Bangkok and Pattaya and offer rental and property management services for residential and hospitality properties, like luxury homes, penthouses, and villas. In addition to property management services, it’s a real estate agency that helps expats to buy property and to settle in Thailand. The property management services are offered to residential and hospitality properties, including rental management, inspections, contract preparation, and cleaning. Central Property Pattaya is a real estate agency and a property management company. They help locals and expats in buying and renting residential properties, like houses, condos, and land in Pattaya. It’s also a property listing website. Frank O’Neill, originally from the UK, works as the Sales Manager and leads a team of multilingual staff of sales executives and real estate agents. The property management services are offered to individuals as well as companies for house and condominium projects. Examples of services services include advertising, tenant screening, contract preparations, and dispute & emergency management. They charge a fee of 15% of the monthly rental for their property management service. Black & White Property is a leading property management, development, and real estate consultancy firm in Pattaya. It also acts as a property listing website for property sales and rentals. The company offers property management services for residential clients and having houses and condos. They also offer rental services. Below I’ve listed popular property management companies in Koh Samui. Horizon Homes is a leading real estate agency based in Koh Samui. It was founded by a British national, William McClintock, in 2007. William has lived in Thailand for decades and have 45 years of experience working in the real estate sector in Thailand and the UK. He’s also working as director of The Guild of Professional Estate Agents that represent 700 real estate agents all around the globe. Alexander Armitage, also a British national, is also a co-founder and works as development manager at the company. He settled in Thailand in 2004 after working in the real estate sector in the UK for several years. Horizon Homes is a well reputed company that won several awards in the last few years, including “Best Developer Koh Samui” in 2017 by Dot Property Thailand. They mostly provide villa and luxury condominium management and rental services. The services also includes construction and onsite maintenance of villas. Samui Property is a family business that offers property management services to hotels and residential clients. The company was founded in 2012. The services offered by Samui Property Services include property rental management (hotels and residential projects) and property design & build. They offer services like land purchase, construction, project management, and rental management for residential properties. In addition to property management services, they offer pool management services as well. Estate Samui is a real estate agency, property listing website, and a property management company based in Koh Samui. They offer property and rental management services to residential and hospitality properties like houses, apartments, and villas. The services include marketing and rental booking management. The company allows clients to choose from full property management solutions, like rental and booking management services. Other services include cleaning service, sourcing live-in staff, pool and garden maintenance, and tenant screening. thanks for great article and provided information. I contact a few listed service provider for collaberation. Waitting for next article.